Two years ago THP hosted its first annual 12 Days of Holiday Cheer. A contest unlike any other on the internet and it quickly became “legendary” in that THP gave away unbelievable prizes for 12 straight days over the course of the Holiday season. With the holidays approaching quickly, we are now announcing the 3rd annual event and have taken this iconic event to a new level. This contest is a thank you of sorts. A thank you from the entire staff at THP as well as all the wonderful companies that are involved in this unbelievable event. As with everything that THP does, we wanted to raise the bar from last year’s epic contest and so this year 12 Days of Holiday Cheer in actuality will be 17 days long. That’s right! 18 days of contests ONLY on THP. 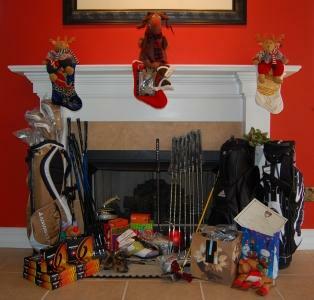 Nothing means the holidays more than giving and THP wants to give away some fantastic gifts to all of our readers. Entering the contest is as easy as sending a single email. Your job is to send an email to contests@thehackersparadise.com and in 50 words or less, explain why you love THP, by doing so you will automatically be entered in all 19 days of contests. You can tune into the THP Forum each night at 8pm EST when we announce the winners. The deadline of this contest is Sunday December 11th, 2011 at 11:59pm EST. All entries must be received by then to be considered. Winners start getting announced Monday the 12th. Your email counts as 1 entry in the “hat” for each day. You must include your forum screen name, twitter handle & Facebook Page link in the email sent to qualify for the extra entries. Day 1 – Bridgestone – 1 year supply of golf balls (12 dozen) after going through a B-Fit session. We wish you all good luck and hope you enjoy the 3rd Annual THP 12 Days of Holiday Cheer. Remember to check the THP Forum contest section each night to find out if you were a lucky winner. THP is amazing! How are able to keep outdoing yourselves! Amazing list of prizes!!! THP just never does anything halfway. Another incredible holiday contest. Thank you! Wow, awesome prizes this year!!! Thanks to THP and all the manufactures for this event!! Going to be some very happy Hackers this holiday season!!! Awesome!! Amazing prizes, thanks THP and all the manufacturers. Wow, you guys are making Santa look bad! Thanks to all the OEMs for trusting and investing in social media! Once again THP and the manufacturers have pushed the edge of the envelope. Just hope some of those things will fit down our chimney when the big red fat man arrives on the 24th. Nothing is better than a THP holiday season!!! Thanks again THP for everything you do and Happy Holidays!! Just another reason why you guys are the greatest! Wow….really cool! I LOVE THIS SITE!!! Thanks to THP and the companies involved. This will be great fun. Good luck everyone. WOW, you guys rock…..thanks to THP and all the great Sponsors who make this possible! You guys are amazing! Thanks for all you do for the golf community before we even get started. THP bringing the epicness as always. Thanks so much for all you do. Can’t say it enough! Happy Holidays! THP just continues to get better and better! Never ceases to amaze me! Thanks THP!! Fab ! I SO need a new Driver ! Merry Xmas all ! Get in the ho ho hole ! What a great list of prizes…again! THP Media and its sponsors really know how to show their appreciation of their readers and fans. Thanks. An awesome contest with awesome prizes! Thanks THP! The appreciation you show for your forum members is part of what makes this the best golf site there is! Hopefully I get something! New to THP but have a feeling I will be around a long time! Thanks THP for being so awesome!! The event just keeps getting longer. How awesome is this?! Thanks THP and all of the companies for this contest! Unbelievable! Thanks to all the companies and THP for doing this! This is great!!! And it keeps getting better! Very awesome. THP proves once again that the cream rises to the top. Thank you to all the OEM’s and sponsors. Thanks to THP and all the participating companies! Thanks THP and all the sponsors. A wonderful holiday contest! Merry Christmas to all. Going through this list again and I am just blown away. Thank you sponsors and THP for your generosity! Amazing list of prizes! Thanks THP! This has been a blast to follow and watch the excitement of lucky THP’ers winning some amazing prizes! Thanks again to THP and all of the companies gracious enough to donate goods for the giveaway!! Last night and finishing it with a bang!! Hello SeeMore! This has been a blast, thanks again THP! That wraps it up for another year, Thank You to all of the great sponsors and to THP for making the Holiday Season so much fun, and a special Thank You to Ping for the great Scottsdale ZB that I was lucky enough to win. Thank you to THP and all of the sponsors for making the holidays even more exciting for us hackers. Thanks especially to SeeMore for the wonderful putter!